For me what makes this tragedy even more shocking is the immediacy, given that little more than fifteen hours ago, he was upbeat at interview, chatting about attacking on Monte Bondone, because he was feeling good. Then true to his word, he did and ended the race, rolling over the line in the elite lead group. For those old enough to remember as adults, it's left me with a very similar feeling upon waking up on that fateful, Valentine's day, back in 2004. Gutted after seeing the news appear in my online paper this morning. Indeed MV, the world needs more pirates, not less. That's a big gap all of a sudden, which the other day still had a happy go lucky Michele in it. Sod cycling, father too. What a waste. That's sad. In later years I admired him for being one of the sports real personalities (not just sports machines). I love birds (due to allergy issues the tame ones in my house have been gone for years) and it was the videos of him with the parrot Frankie that made me see more than the cyclist. Still, it was as a cyclist I was looking forward to see him next time, as the Astana captain in the Giro. 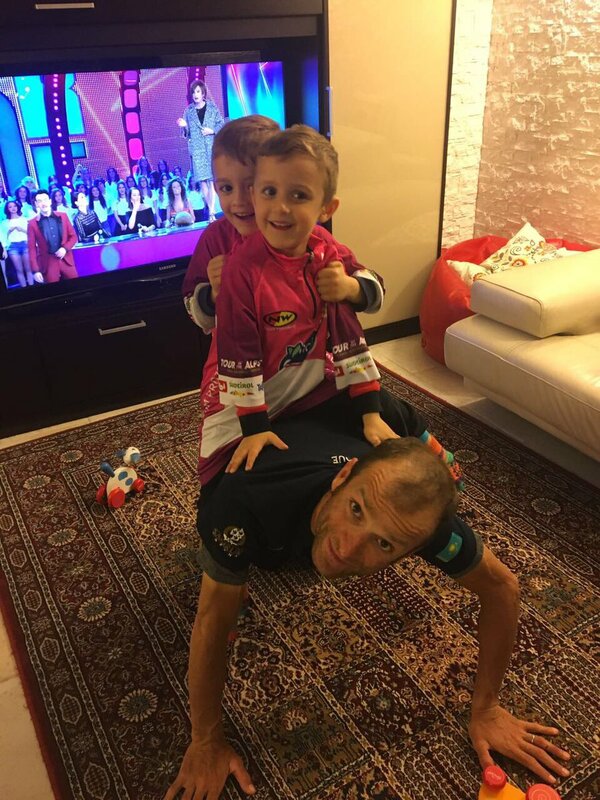 Now my best memory of him (besides training with Frankie) will be the finale of last year's Giro where he was a key rider in the attack that won the maglia rosa for Nibali. I can't add much except to say I agree with all you guys have written above. When the first tweet came through this morning I sat there hoping so much it was some awful mistake. But it wasn't and the sport is poorer place without his personality. That ready smile and laughter, the parrot, the songs, his love of life and his family ... all of it brought me to appreciate him more as a rider. Backwards I know, but that's how it was for me. I can't imagine how it is for his family...those two boys, his wife. Life is fragile my friends and we have to live it while we can.. Absolutely stunned this morning. Such a tragedy for his family, but a huge loss for the cycling community too. Enjoyed watching him in the Alps the past week and he was first pick for my Giro CQ team like most years because of his guaranteed ability to perform at some level. I came to cycling probably after his best years and Giro win, but like has been said above that didn't stop him making an impression. he has been a key super Dom for numerous Astana riders, selfless for his team but also a guy who was entertaining and I always enjoyed seeing get a good result. The Giro and cycling in general will be diminished for his loss. Gosh, that is so moving, it's hard too watch. I enjoyed watching him talk as much as I enjoyed watching him ride. And I don't even understand Italian! But his eyes were always sparkling and he was so animated. Wish I knew what to say, really. I'm still stunned. Really can't believe Boots could be gone. Love the vid of Michele & Frankje. flip, just awful news. Cycling is extraordinary, full of such life-affirming, exhilarating joys and then such gut-wrenching sadnesses way, way too often. Life is very hard. I read search's message and the article yesterday morning, then had to get out to get milk and stuff, thinking about Michele. I like the way he rides a lot (past tense now) with legs seemingly stretched just right for each pedal stroke and the circular motion of the hips and try to remember and copy when I go out. On the way back I stopped behind a car that had stopped for a funeral procession. There was a line of cars slowly passing behind the black car a little like ammiraglie in the neutral zone before a cycle race. Two days ago someone I know was in hospital for surgery and though it was a routine procedure I was worried anyway. 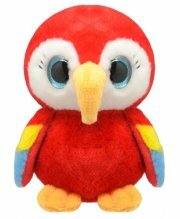 Thursday I had brought her a stuffed animal parrot like this as a mascot. Everything is going ok for now. 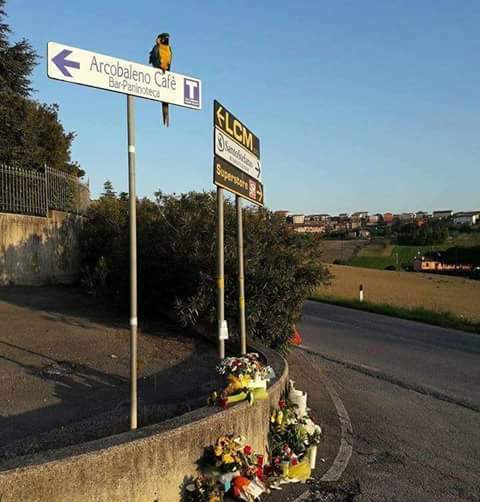 The driver of the van was a local, and is well-known by the family, says Scarponi's father: “We know each other well. 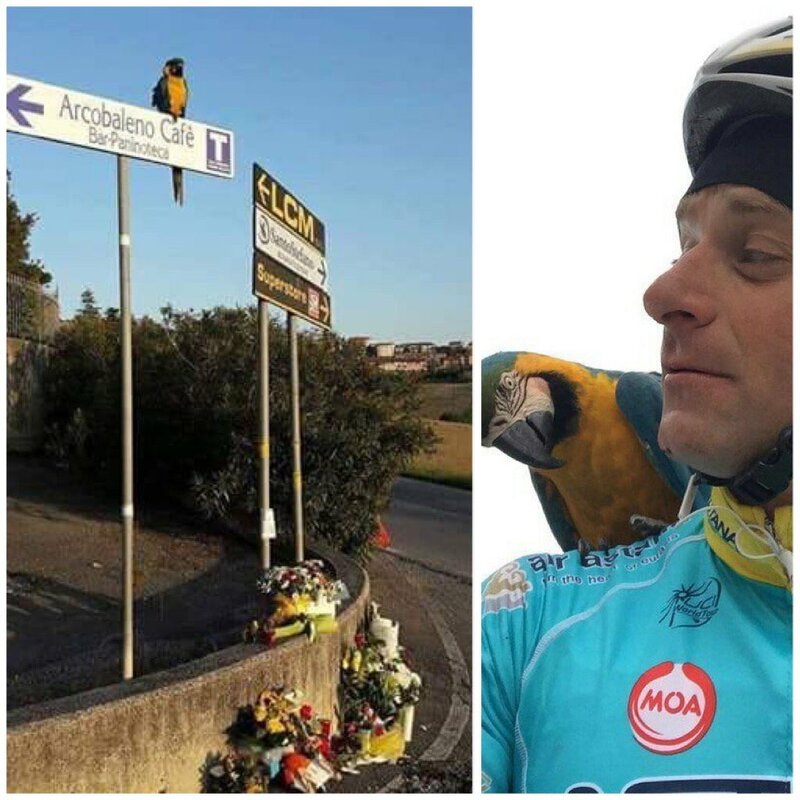 I’ve lost a son, but I’m thinking of him too,” Scarponi’s father, Giacomo, said. Rest in peace, young man. We hardly knew ye. There's more, still. Raimondas Rumsas' 21-year-old son, Linas, was found dead in his home this morning. What a horrible time for cycling. “He’s from Montoro, where my grandparents live, and it was after the Tour that Nibali won, in 2014, I was out on my bike, and then, ‘what the hell – a parrot above my head? Mamma mia.’ He started to dive towards me and I had to grab the brakes. When you’re seeing parrots that means it’s time to head home. But as soon as I set off again he attacked again and I got really scared. “This hunt continued for months. And then I said, ‘Enough! I need to talk to his owner – I can’t train’. I came to Montoro and saw him right away, sitting on the shoulder of his owner’s friend. He put him on my shoulder and that was a breakthrough. Perhaps Frankje concluded he’d signed with Astana, or that I was a parrot like him. Anyway, we started training together, slowly at first. But now he accompanies me, flying along for 10-15km.